Beginning April 23-25, students in grades 9 and 10 will take the New Jersey Student Learning Assessments, formally known as PARCC. Only 9th and 10th grade students will be assessed in English Language Arts and Math. Students in grades 9 and 10 will report to school at the regular time. The assessment will begin promptly at 7:44 a.m.
Students in grades 11 and 12 will report to school at 10:00 a.m. on Tuesday, April 23rd and Wednesday, April 24th and report to the auditorium for an assembly on Tuesday and Wednesday. On Thursday, April 25th, there will be no assembly program for 11th and 12th graders. Period 2 will begin at 9:50 am. If you report after this time, you will be late for school. We will follow a modified bell schedule on testing days. "Congratulations to the Cast, Pit and Crew of Chicago!" Click the link below for a full photo gallery. NPHS Junior Alec Fox recently competed at the New Jersey Regional Science Fair (NJRSF) at Rutgers University on March 15-16th with his project titled Synthesis and Testing Novel CCR1 Receptor Antagonists for Glioblastoma Treatment, which was aimed at discovering new drug compounds to treat an aggressive form of brain cancer. He won 1st place for the Chemistry Special Award (sponsored by the American Chemical Society), 2nd place overall in the Chemistry and Material Science division, an opportunity to publish his work as well as $350 in total prize money. Congratulations! 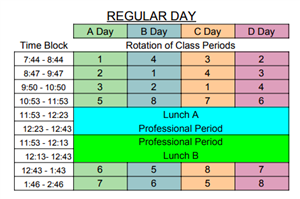 The school day begins at 7:44. Thirty-seven new members of the National Art Honor Society were inducted into the National Art Honor Society on November 1, 2018. The society raises money for charitable causes, funds scholarships for art students, and beautifies the school with murals. This year the NPHS Future Civic Leaders Club is creating periodic club newsletters to share information. Senior student Isabelle Marenberg has created this month's FCL newsletter. Make sure to check it out to see who the club members of the month are! "The 2018 Science Exchange with sister school Koshi Super Science High School from Japan was the most successful one to date. Not only did our 25 Japanese counterparts from Fukui Prefecture deliver science presentations in English, but they were able to hear science presentations from our Pioneers, practice the art of gyotaku fish printing with Mrs. Celler, perform Japanese hand percussion exercises with Mrs. Kirkland, and participated in American cultural booths delivered entirely in Japanese by sophomores, juniors and seniors! Host students attended field trips with their homestay students, which included tours of Rutgers and Princeton Universities as well as the Liberty Science Center." Recognized for excellence in Academics, the Arts, and Athletics, New Providence High School provides students with a wide range of experiences and opportunities designed to promote intellectual, social, and emotional growth. Our commitment to education has been recognized through many accolades. We continue to be recognized as one of the top high schools in the state of New Jersey. Additionally, we were recognized as a Blue Ribbon School by the U.S. Department of Education. This is the highest recognition that a school can receive on the federal level. These honors are a testament to the dedication of our students, faculty and community. NPHS students are able to choose from a wide array of academic course offerings designed to challenge them at appropriate levels of ability. Twenty-three Advanced Placement and fifteen Honors classes are offered. Advanced Placement courses offer students the challenges of a college-level course as well as the opportunity to accumulate college credits. New Providence High School remains committed to maximizing student opportunities for growth, evidenced by our continuing exploration of local, state, and global partnerships. Instruction is offered in five world languages. Ongoing international partnerships continue with Japan for over 20 years. These programs have given students invaluable insight into different cultures as well as practical application of what they have learned in the classroom. Incorporating service learning opportunities into the fabric of the educational process provides students with challenges and experiences both within and outside the traditional classroom. Student-sponsored food and clothing drives, choral performances at local senior citizens centers, volunteer tutoring programs, invitations to design banners and logos for community organizations both challenge and reward students’ creativity. These activities give New Providence High School students an opportunity to give back and show appreciation for all they are given. Furthermore, these experiences demonstrate what can be achieved when parents, students, teachers and community members work cooperatively. Our co-curricular offerings, from discipline-specific clubs to athletics to drama, are designed to allow students the opportunity to pursue their interests and achieve new heights. Offering twenty-three athletic teams and nearly forty co-curricular activities, over 92% of the student body is involved in the school’s athletic and co-curricular opportunities. Our Technology Student Association won first place in technology problem solving and second place in structural design engineering and music production in a New Jersey State competition. NPHS STEM league students also placed first at the STEM League Competition in Bloomfield, also winning most creative prototype and best overall prototype design. They also placed in the top three at the Annual UCC Bridge Building Competition. Our Girls’ Tennis, Girls’ Cross Country, Girls’ Basketball, Boys’ Cross Country, Boys’ Tennis and Boys’ Lacrosse teams were all Conference Champions. Our Girls’ Cross Country, Girls’ Tennis, Girls’ Basketball and Boys’ Tennis teams were also State Sectional Champions. New Providence High School will continue to prepare students to meet the challenging demands of today’s changing world. The school’s successes reflect positively on the continued support of the community. 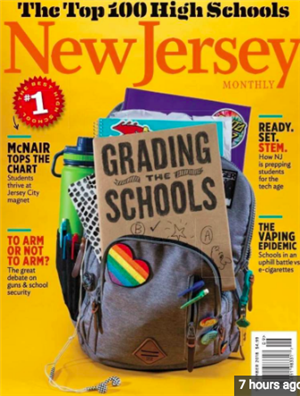 This support is much appreciated and welcomed as NPHS continues to function at the forefront of schools in Union County and in the state of New Jersey.